Construction 3 research was achieved, and all researchers were focused on Construction 4, presumably for boosters. The battle for The Peninsula of Awesomeness was a victory without any losses. It turns out that the province had been completely vacated before the arrival of Sauromatian forces. The minimal provincial defense posed no threat. 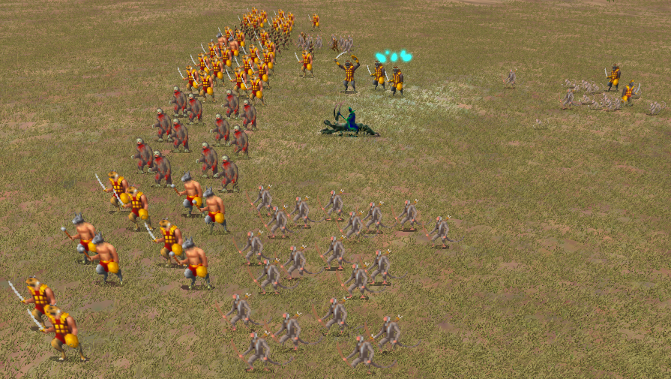 Our Sauromatian armies move northwest into the undefended Lankan province of Vepitre. Dagan the Renegade Sage left us and joined Pangaea. That's it. I would provide a screenshot but really there's nothing to show. The only really interesting thing is that our prophet stayed behind to build a temple in the Peninsula of Awsomeness, and because our net income per turn is about 500 gold we were unable to do any recruiting beyond a single scout. Huh. We're down to 15 candles. Our prophet is preaching in the newly-constructed temple on Lanka's border, and we have a priestess with a Jade Knife sacrificing a single slave in Worshin. Because she's only sacrificing one slave she doesn't actually need the knife, but oh well. Our big army pulls back to protect the temple in the Peninsula of Awesomeness, and we're back to recruiting a Witch King and an Enarie at our two forts. It looks like we are also sending a small squad up to Nardago, which is the province to the west of Lanka's capitol (and just across the bridge from Hinnom). Apparently we arranged some kind of trade with Hinnom for a Dwarven Hammer. That arrived this turn. Also, we reached Construction 4 and Evocation 3 this turn. That's not terrible, really. All research is now switching to Alteration. At this point in the game I actually know why we've switched. Xanrick is planning to research Body Ethereal, and use that to buff a bunch of markata to make them almost halfway effective as chaff/blockers for his archers and Witch Kings. Body Ethereal requires Alteration 3, which will take about two turns to achieve. Now for the battles. Battles, you ask? Yes! Two! First let's talk about the one we were expecting. 5 Cataphracts and a Lancer, backed up by our starting commander with her Banefire Crossbow. That should be sufficient to clear out a few monkeys... hm. 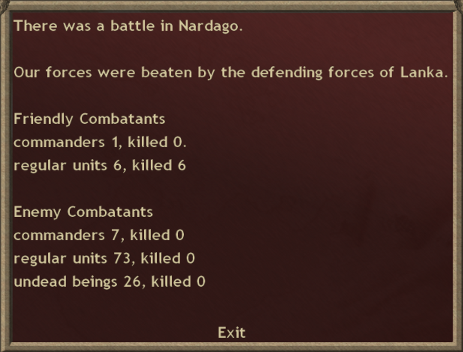 Of those 73 regular units, I believe that 33 of them were atavi (or tribal) archers. That leaves 40 sacred demons, and I counted 7 of the weaker Anasura which of course leaves 33 Palankasha. This is a formidable force and we appear to have gotten its attention, since it must have returned from the Hinnom front to deal with our incursion. Whoops! The other battle took place on our border with Hinnom. That force of Lankan raiders I mentioned continued into our territory from Hinnom. I don't need to show it, really. It's a priest leading 5 Palankasha. They destroyed our provincial defense. In response we sent the bulk of our forces back to protect the heartland. 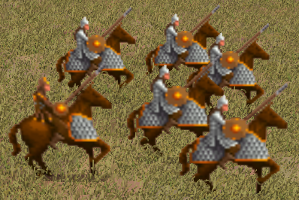 A Witch King leads 5 Cataphracts north into Remecia (just south of Lanka's capitol). Normally I would dismiss this move as ridiculous, since Lanka has a huge army that can easily move into that province to defend it. However, our scouts tell us that Hinnom seems to have flown a Melqart onto Lanka's capitol, driven off the defenders, and laid siege to the fortress there. We have no eyes on Hinnom and I have no record of conversations between buildscharacter and Xanrick so I don't know if this was a strike coordinated between them, a desperation move by buildscharacter, or what. The point is that TheDemon has to split his forces to deal with both the Melqart and the threat of my attacks. The reality of course is that he could split his army into three parts and still successfully defend his territory from my "raiders," drive off the melqart, and take Vepitre back from us. We'll have to wait until next turn to see what actually happens. Speaking of next turn, turn 30 is when I actually take over for Sauromatia. No more speculating about motivations or diplomatic activity, no more vague narratives of battles. Finally I can treat you all to an in-depth look of my thought process as I gently guide Sauromatia through its darkest moments. Whether I'm leading this poor, battered nation to destruction or glory will have to remain a mytery! All I can guarantee is that there will be graphs. There will be metagame commentary. There will be additions to the Irrational Objectives List.